‘Away from the Western Front’ is a registered Charitable Incorporated Organisation (number 1167582). Most of the activities represented on this website have taken place as part of a two year project (2017-2019) funded by the Heritage Lottery Fund, with additional grants from the British Institute for the Study of Iraq (Gertrude Bell Memorial) and the Centre for Hidden Histories. 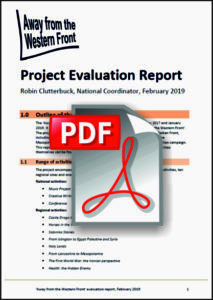 On completion of the project we are delighted to offer you the opportunity to read our comprehensive evaluation report. Click on the image to open the PDF in a new window. Why ‘Away from the Western Front’? The Western Front has remained the main focus for European commemoration of the First World War but the campaigns which took place away from the Western Front allow us to place the war in a global context, in which several empires grappled for world power and influence, leading to a major reorganisation of the international political situation in the years following the war. Britain’s part in this, its attempts to safeguard its place on the world stage and the consequences of this are as important as any European outcomes. A central aim of the ‘Away from the Western Front’ project has been to understand what made the conflict a World War. Why is it still important today? Most of the campaigns featured in the project took place in areas which are now beset with political, religious and social unrest. The roots of many of the problems in the Middle East can be traced back to the First World War: the struggle for control of the Mesopotamian oil fields; the establishment of the state of Israel in Palestine; the rise of Muslim fundamentalism in areas formerly overseen by an Ottoman caliph within a tolerant Ottoman secular state; the arbitrary redrawing of borders on political, not social and ethnic lines, leading to displacement and repression. The recent increase in the number of refugees and asylum seekers fleeing to Europe puts this into a highly relevant contemporary perspective. Which campaigns took place away from the Western Front? What activities have taken place? ‘Away from the Western Front’ has a global reach but focussed on the stories of individuals who were involved in the campaigns. We have used archive records of particular men and women to bring the history to life, engaging people through activities such as film, drama, art, creative writing and music. In many cases these arts activities have been based on new research, exploring local history sources and discovering new perspectives. We have also explored issues which affected many campaigns, such as health. In addition to a range of regional activities, we ran national creative writing and music activities as well as a conference and remembrance events. Our regional projects were designed for local audiences in Britain, but through this website the activities have been able reach people all over the world. It can be said that the world lives in Britain today anyway. There are diverse multi-ethnic communities from many of the countries where the campaigns took place, as well as from the colonial armies of the former British Empire – India, Pakistan, the West Indies or Africa – so we have been able to explore different perspectives of the First World War face-to-face. With modern communications it has also been feasible to involve people remotely in countries such as Turkey, Iraq, India and Tanzania. Alan Wakefield, Head of First World War and Early 20th Century Conflict at the Imperial War Museum, author of ‘Under the Devil’s Eye’ (Salonika) and ‘From Basra to Baghdad’ (Mesopotamia). Burçin Çakır, Turkish military historian based in the U.K., with a particular expertise in the Ottomans in the First World War. Major Paul Knight, PhD, VR, military historian and serving army officer, author of ‘The British Army in Mesopotamia, 1914-1918’. Dr. Anne Samson, coordinator of the Great War in Africa Association. Gareth Davies, M.A., who spent 28 years in the regular army, including postings in the Balkans and Middle East, and is now an army reservist, battlefield guide and expert on the First World War, and the Palestine Campaign in particular. Stuart Hadaway, military historian and former curator of the Air Force Museum, author of ‘Pyramids and Fleshpots: The Egyptian, Senussi and Eastern Mediterranean Campaigns, 1914-16’. For more information or to contribute, email info@awayfromthewesternfront.org.